Mr. Shimon Romach served in the IDF including the 1967 war and was released with the rank of Lieutenant. In the years 1979-1981, he was a security officer in Portugal and Canada, in charge for the security of EL-AL, Israeli airline. 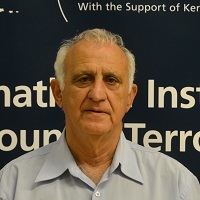 Mr. Romach served in the ISA in several positions, mainly in the anti-terror intelligence section. Served in the Gaza Strip, West Bank and Lebanon. In the years 1993-2002 he worked in the private business sector and was also the general manager of manpower company. From 2002-2011, he served as the Fire & Rescue Commissioner. He holds a B.A. in Israel Studies and Political Science from Bar Ilan University and conduced one year course of business administration at Hebrew University of Jerusalem and two courses, one year each, Management Diploma, Israeli Air Force.